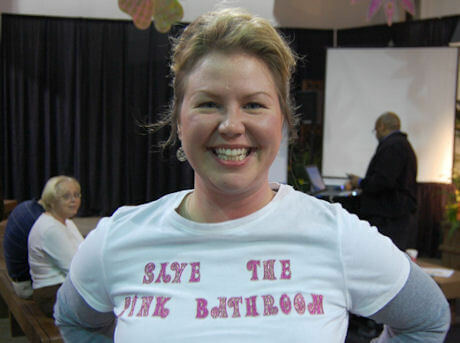 I couldn’t stop smiling all day long after Taylor — a Retro Renovation reader from Charleston — showed up at my Save The Pink Bathrooms talk in Charlotte wearing our first-ever Save The Pink Bathrooms tee shirt. That’s Elaine, another reader, over Taylor’s right shoulder, and over by the screen you can see Ken, A/V expert for all my talks. The whole thing was A BLAST — especially Friday, when lots of readers showed up in force. Scathing Jane came from Atlanta! Lauren came from near Philadelphia! Teresa, Linda, Micheal, Edwin, Pete, Hugh, Cathy, Lila, Gail… oh my, there were more, too! You all get exclamation points! It was so much fun to meet everyone, and to get all excited talking about our kitchens and our bathrooms and our mint-in-box finds and our prayers to the retro decorating gods and our families who don’t quite understand but certainly are amused. I have to say, the whole 5-talks-in-2-days-plus-media-interviews-plus-my-mom-was-with-me thing was, umm, stressful. So I can’t even remember everyone’s name my brain cells were so pressurized and big boo boo, I wasn’t taking notes. I’ll be back in home on Sunday night and will start queuing up all the photos. Everyone who came: Please send me an email (retrorenovation [at] gmail [dot] com), or comment when you see your photo, because I really want to recognize everyone. Oh my, what a wonderful wonderful experience it was to spend time with you. YOU ROCK! dotty aka taylor, i tried to email you but it bounced. can you email me at retrorenovation [at] gmail [dot] com — i’d love to see and post your time capsule pics!